Flexi Trak Large Anchoring Device is an easy-to-use, hassle-free appliance that can be conveniently used to anchor tubes and catheters to skin sans pain or irritation. This Flexi Trak device can be conveniently used to anchor urinary catheters, chest tubes and gastrostomy tubes to the skin within moments and without any unnecessary hassle. 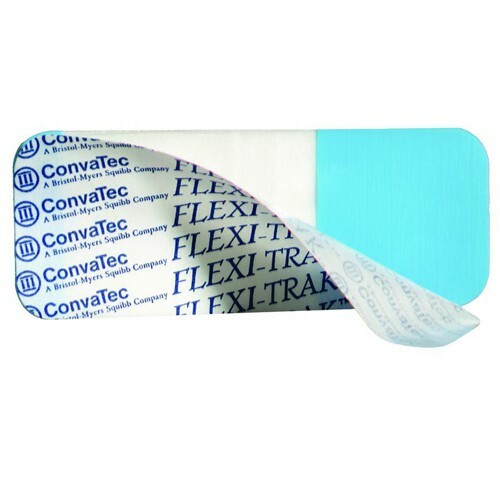 Flexi Trak Large Anchoring Device is a gentle adhesive that can be directly applied to the skin without causing redness, itching or irritation. This Flexi Trak Anchoring Device is a great way to secure urinary catheters, chest tubes and gastrostomy tubes to the skin with little exertion. You might also be interested in similar catheter fastener products that we carry, such as Cath-Strip Reclosable Catheter Fastener. For anchoring tubes and catheters to skin. Used to anchor urinary catheters, gastrostomy tubes and chest tubes. I just have a quick question about the FLEXI TRAK LARGE ANCHORING DEVICE ConvaTec. I would be using it for my J-Tube and was wondering how does it work? I saw a video for another product, just wondered how it would hold my tube in place? Thank you for your help in this matter. I just started using this forty J tube and love it. It does not swivel like a stat lock so it feels more secure. I have been able to readjust the tube when needed. I have very sensitive skin and so far so good.